The Puna Coast is one of the state’s least developed coastlines. The area is best seen in an all-day excursion. Things to enjoy along this route include vast lava flows, black sand beaches, natural warm springs at Kapoho, and Lava Tree State park. From Volcano Village take Highway 11 north. At the Keaau Intersection take highway 130. 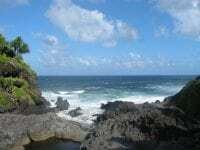 Stop at historic Pahoa town and continue towards Kalapana. At the end of the road take Highway 137 north. At the intersection with Highway 132 take a left back toward Pahoa town.